Today is Day One of Papertrey Ink's April release countdown, and I am thrilled to help introduce two new, super cool agate and geode products. The first is the Text & Texture: Agate stamp set, and the second is the Geode Layers die set. All of the new products will be available at 10 pm ET April 15 in the Papertrey Ink store. 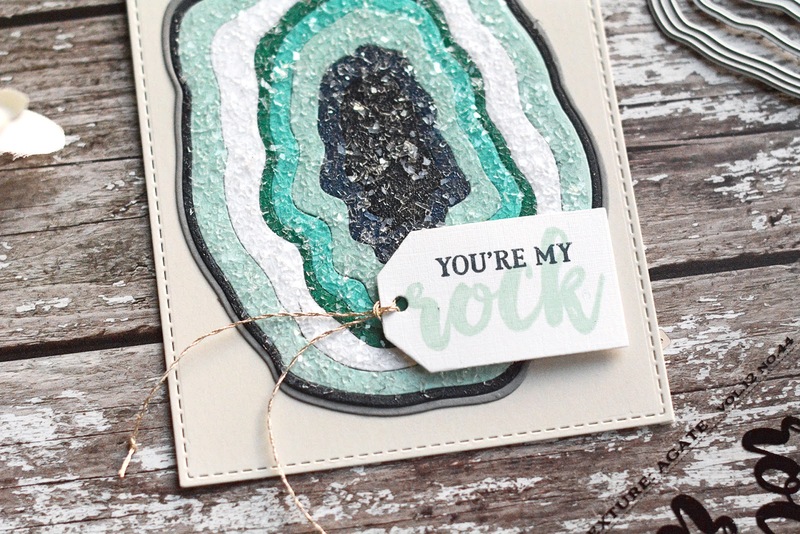 My first project features the Text & Texture: Agate stamp set and some ink blending in shades of blue and green. 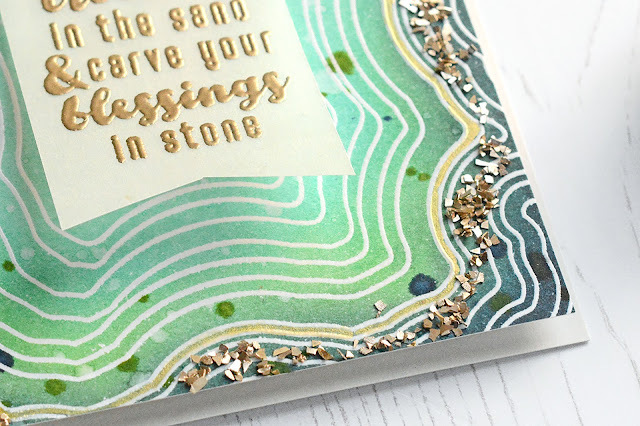 The background stamp is a generous 5 3/4 square, so not only does it cover the full background, but you also have some choice about which parts to show. Also included are a handful of sentiments, the one shown here plus several phrases built around the word "rock." This background was super fun to play with! I decided to ink blend the concentric circles in different shades of blues and greens, starting with a light Aqua Mist and finishing with Dark Indigo. I added some water splatters and ink splatters for texture. Next, I used some metallic watercolor to paint one of the rings a shimmery gold. The effect in real life is so pretty! I stamped my sentiment in Versamark ink, heat embossed in gold, and stitched it onto the background with gold thread. I wanted a little more gold, so I added some gold glass glitter around the gold painted ring. 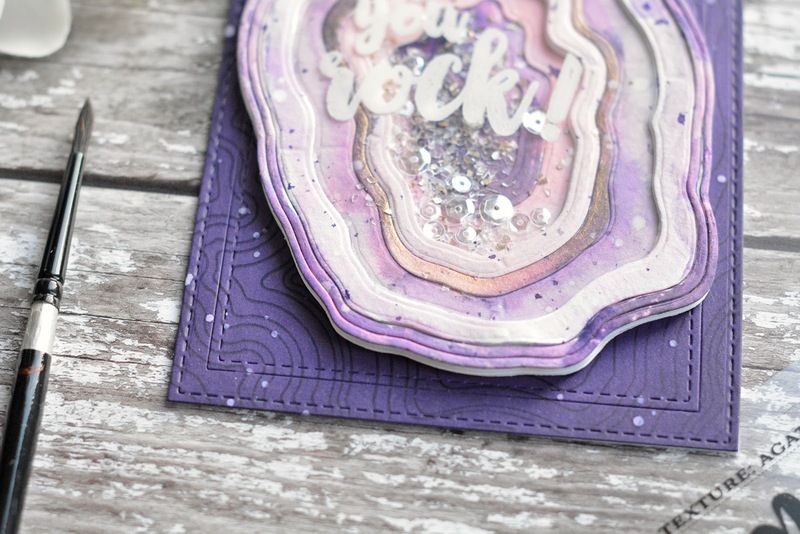 Next is a look at the Geode Layers die set. 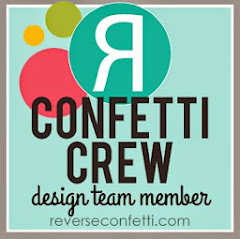 For this card, I die-cut the layers from different shades of blue card stock, as well as white and the new gray. I kept my die set together as opposed to snipping the individual rings apart. This allowed me to easily inlay all the rings back into a one-layer geode. 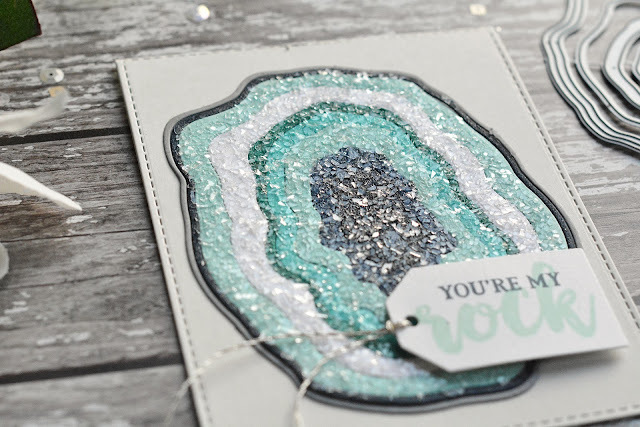 I added a coating of clear glass glitter to mimic the crystal interior of a geode. 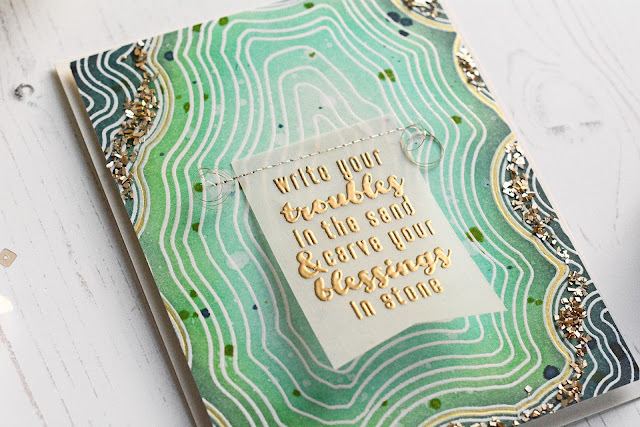 And last is a two-toned sentiment from Text & Texture: Agate that I stamped onto a Tremendous Tags die-cut. 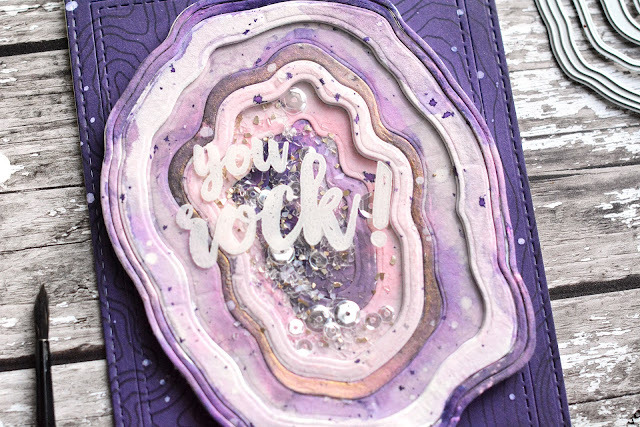 For my last card, I die-cut a full geode (dies still attached, not cut apart), then watercolored the different Geode Layers rings using reindeers in different shades of purple, along with a hint of metallic gold. 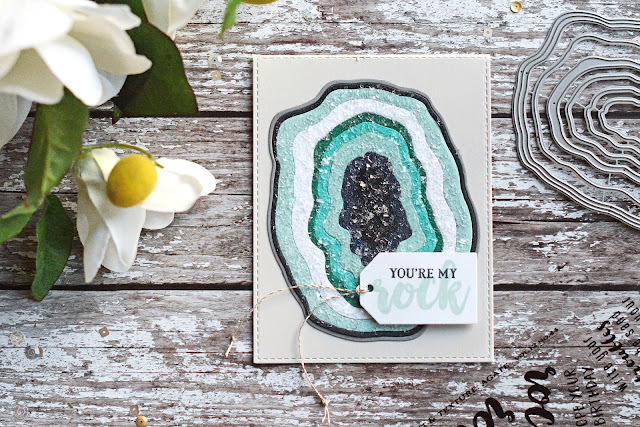 I also die-cut a whole bunch of extra geodes from white card stock, then proceeded to "reverse layer" the geode so that the outer rings are raised and the center is recessed. This created a cavity of sorts, which I filled with clear glitter and sequins to make a shaker. 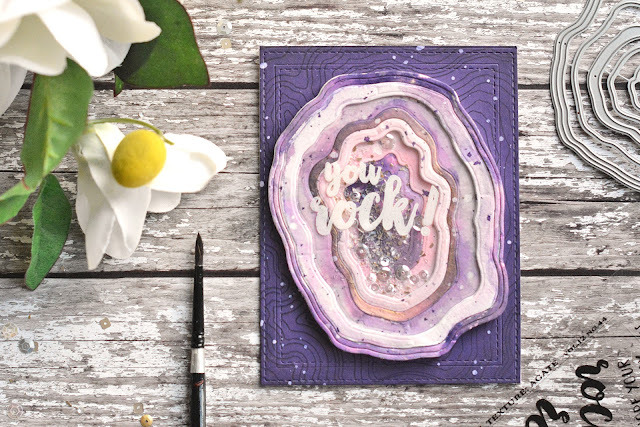 I stamped the Text & Texture: Agate sentiment in white Staz-On onto the acetate layer right over the geode interior. Here you can also see the beautiful gold watercolor shimmer on that one ring. I placed the finished geode shaker onto a Royal Velvet background stamped with the Text & Texture: Agate background. That's it for me today. 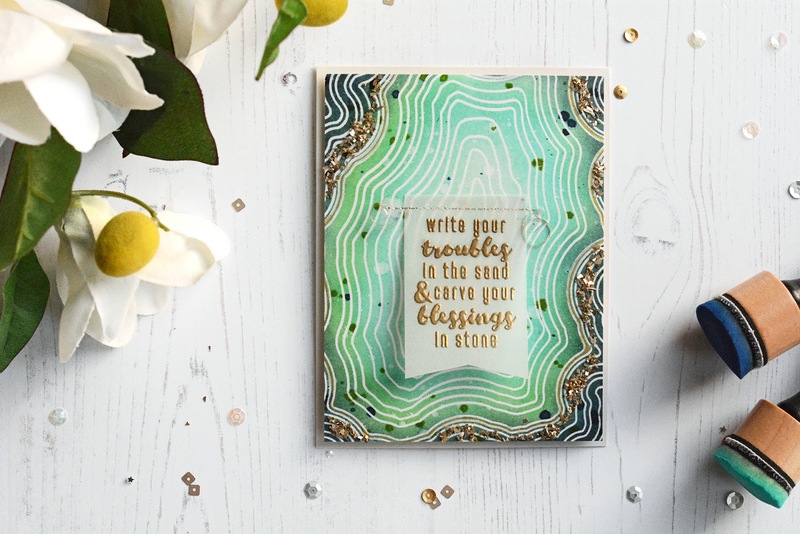 Be sure to head over to the Papertrey Ink blog for a look at the rest of today's featured products and lots more inspiration from the design team!